—If they were fighting against the new government and in defense of Ceausescu, then why didn’t they seize and hold any buildings? Such is the type of question oft-heard among those convinced that the outcome “proves” or reveals the motivation of the perpetrators. 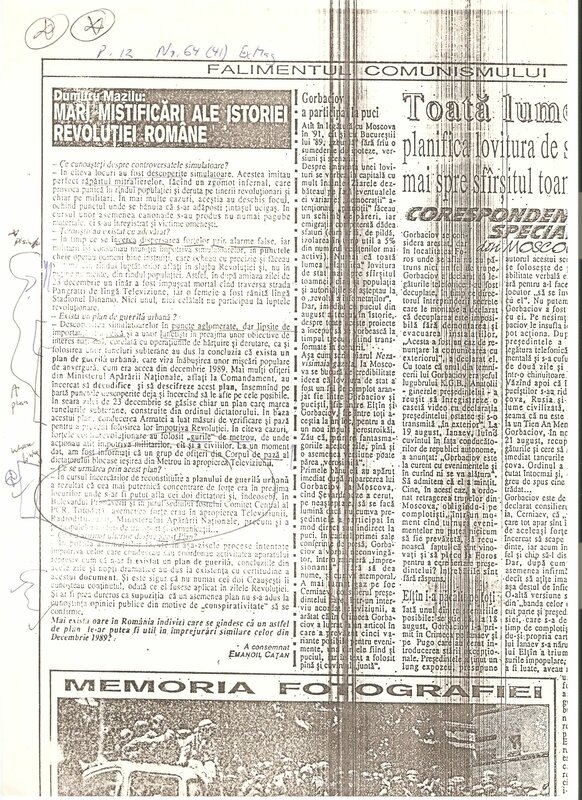 Dumitru Mazilu discusses “operatiunile de hartuire si derutare” in this 1991 interview with Emanoil Catan in the weekly Expres Magazin in late 1991. However, all of this is based on a giant assumption, an assumption so basic that it is easily overlooked that it is an assumption: that the goal of those fighting was to conquer buildings and hold them. Guerrilla warfare is one characteristic of an insurgency. The guerrilla is the combat element to the insurgency. When guerrilla forces first become operational, they usually engage in limited or small-scale operations. If they reach more sophisticated levels of organization, equipment, and training, larger operations using more conventional tactics may be expected. Insurgent tactics are characterized by elusiveness, surprise, and brief, violent action. These tactics in the early phases can be divided into two areas: terrorism and harassment. a. Terrorism. The guerrilla can use terrorism to accomplish his goals. Terrorist techniques include bombings, assassinations, kidnappings, threats, mutilation, murder, torture, and blackmail. Not all guerrillas use terrorism as a tool. If terrorism is used, it is usually for coercion or intimidation. Terrorism may also be used to discredit the government by provoking the government into overreactions that alienate the populace or demonstrate its inability to protect them. This persuades individuals to act favorably in given situations toward the guerrilla or insurgent movement–for example, to persuade a local mayor to revise policy concerning the guerrilla or to gain passive support while at the same time redirecting resources to the insurgent movement. (2) Intimidation. This modifies behavior. Usually, threats or fear of harm are used either toward the individual or his family and friends. Intimidation induces the populace to silence or noncooperation with government forces. It discourages competent citizens from accepting vital low-level government positions–for example, the killing of servicemen to encourage draft evasion. (2) The guerrilla uses infiltration during movements. However, near the target area, small guerrilla elements mass and then conduct operations. The most common techniques employed by the guerrilla are the ambush, raid, and small-scale attacks. These are usually targeted against security posts, small forces, facilities, and LOC. (3) While government forces outnumber the guerrilla, the guerrilla seeks to attain local numerical superiority. Then, he can attain victory over small elements of the government forces. These tactics, if successful, compel government forces to commit larger elements to defensive tasks. Once government forces move to the defensive, they lose the initiative and become reactive. This allows the guerrilla time and space to develop so that he can engage larger government forces with more conventional tactics.